Be met at the exit of the airport by the tour guide, who will hold a paper sign with your name on for you to recognize. In the morning, visit the historic Tiananmen Square and the majestic imperial palace Forbidden City. Spend a pleasant afternoon in the beautiful imperial garden Summer Palace, and then drop by the Silk Factory to appreciate Chinese silk culture. Be transferred back to hotel. It is so pleasant to spend the morning on the spectacular Badaling Great Wall, the most popularly visited section of Great Wall. The Dingling underground Palace of Ming Tombs will enhance your admiration for Chinese history. Drop by the Cloisonne Factory to appreciate Chinese handicraft culture. Drive back downtown and pay an exterior visit to the novel designed Bird’s Nest and Water Cube in Olympic Green. Spend our last day sightseeing in Beijing. Go to the old Hutong to see Beijing’s past life; a Hutong rickshaw trip is popular way to explore the Hutong. Move on to the Temple of Heaven where emperors held grand sacrifice ceremony to God of Heaven. Be transferred to airport and fly to Xian. Xian airport to hotel transfer. 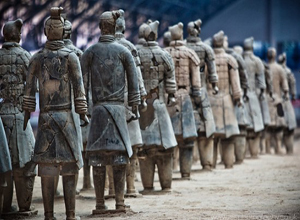 Our first stop in Xian is the most famous Terracotta Warriors and Horses-hundreds of real-size army has guarding the tomb of the first Chinese emperor for more than 2000 years. The drop-by visit to the Xan Art Pottery Factory gives you oppotunity to buy copies of Terracotta Warriors and Horses as souvenirs. After a typical Chinese lunch, transfre to visit the Forest of Stone Steles Museum. Morning visit at the Shaanxi History Museum, a first-rate museum that displays Chinese history, and the sacred Buddhist architecture Big Wild Goose Pagoda. Afternoon stroll at the top of ancient Xian City Wall. Then go to see a typical old Xian residence-Gao’s Courtyard, where you could enjoy a interesting Shadow Play. Free time before being transfered to airport for departure. Wish you a pleasant journey home! *China internal flights: Beijing-Xian, Xian-Beijing.